Hey folks. Guess what time it is? Oscar night… err… yeah, time for another Protagonize weekly roundup! Once again, I’ll suggest that you sign up as a Protagonize fan on Facebook. I know, it’s a shameless self-promotional appeal, but it’s also a cool way to keep an eye on what’s going on with Protagonize without having to resort to the mess of feeds in your RSS reader. This week’s featured story is “SongWeaver“, a linear story by new author Terran_Nytefyer. Since the story was posted yesterday, “SongWeaver” has accumulated an elaborate set of 6 chapters from 3 different authors. As Finn turned a corner, to make his way to another street through an alley, from behind a stack of boxes came an old man. He was wheezing, moaning, and clutching his chest. This week was pretty light from a new feature perspective, but we do have something fun to announce: Protagonize link badges, which we described a few weeks back in our second feature preview article.What are link badges, you ask? 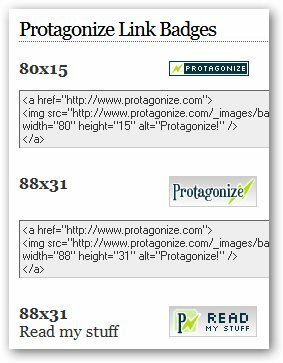 Well, they’re images you can place on your site to link back to Protagonize, in a variety of ways. We’ve provided a variety of sizes and button styles depending on your blog or site layout. http://www.protagonize.com/help/linking.aspxIn the long term, we plan to allow you guys to actually show off your own stories and/or author ratings directly on your sites, but for the time being we hope these will satisfy your linking needs. Well, we didn’t get quite the big headlines we got last week, but this week Protagonize was featured on a variety of smaller yet notable blogs.Rev2.org picked us up with a favourable review, Technosailor blogged about his experiences with writing on Protagonize on his technology and new media blog, and Techvibes posted their monthly Vancouver Start-up Index, in which Protagonize jumped a big 8 spots to land at #12 for the month of February. Sweet! That’s it for this week. We’ll be back next week with more Protagonize goings-on!In the meantime, please spread the word about Protagonize (hit that “share” link on our Facebook product page and get your friends to sign up! ), and be sure sign up on the site and subscribe to our blog at http://blog.protagonize.com. This entry was posted in Features, General, Press, Site updates, weekly roundup and tagged badges, Features, linking, Press, protagonize, rev2.org, technosailor, techvibes, weekly roundup. Bookmark the permalink.